Last Sunday, 24th November, the so-called P5+1 group of nations – the US, the UK, Russia, China, France and Germany – reached an agreement with Iran over Iran’s long-term plan to acquire a nuclear capability. The deal was naturally hailed as a breakthrough by those involved, but in actual fact will only lead to a more dangerous situation. The deal provides Iran with a cessation of the punitive sanctions regime, allowing $7 billion of relief, as well as the time needed to continue to develop a nuclear bomb capability. 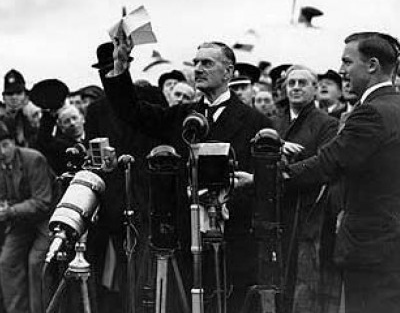 There’s no doubt that what has just happened is akin to the “Peace in our Time” declaration by British Prime Minister Neville Chamberlain in 1983. I believe this deal could well parallel that declaration in 1938. The Iranian leadership (as clearly different to the majority of the Iranian people) has stated many times it is intent on destroying the Jewish nation and is clearly pursuing a nuclear capability. This is chillingly similar to Hitler and the Nazi’s in the 1920’s and 1930’s. Hitler stated openly in print his plan to destroy the Jewish people. The political classes in the West refused to believe he mean what he had said, and instead, they pursued a policy of appeasement. It took a politician of strength and honesty to stand up and be counted. Winston Churchill spoke clearly against this policy and was berated for it at the time. History ultimately showed how prescient Churchill was. I believe Israel is blessed with a similarly bold and honest leader today, even though he is belittled as a war-monger by many sceptics. We should be under no illusion of what is happening. Once again, an enemy of the Jews threatens to destroy them and the major nations refuses to deal strongly with the threat. As Christians and believers in the God of the Bible, we need to recognise this and stand with Israel and the Jews.